It’s like trying to get the yeast out of a baked loaf of bread. 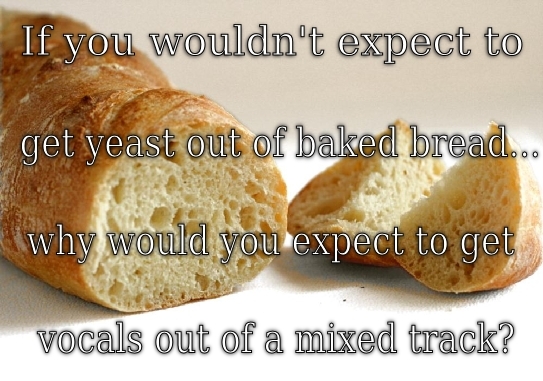 Can’t be done and still preserve the bread… or the song in this case. You can, however use an effect or two that will push the vocals to the “back side” of the track, enabling you to somewhat “hide” them in the mix. But when most people remove vocals, they only take one step, which results in a very “hollow” sounding track of music. If you want to remove vocals using Audacity… and do it in a way that avoids that outcome, you came to the right place because I’m going to show you how! (Thanks for the idea from Joe Gilder over at Home Studio Corner). Many people on MAC have had a hard time finding the plugins mentioned on this video. I’m not a MAC guy, so I don’t know how to help you other than pointing you to the guy whose email address is listed on the plugins inside Audacity. For both the Inverter plugin and the LS Filter plugin, the creator is named Steve and can be reached here (according to the “about” section on the plugin) steve (@) plugin (dot) org (dot) uk – contact him to see if he has an OS version. Split your stereo track into a split mono track (necessary to use the inverter properly on this one). Use the “Inverter” effect (you can also use the “invert” effect if you want… I cover that in this video) to push the vocals to the back of the track. Use a “low pass filter” effect (I give you a handful of them in this tutorial) to make a copy of your original stereo track with a beefed up low end, which returns much of the fullness of the track, minus the vocals! Let me know what you’d like to know how to do using the free Audacity program and I’ll get it put together! It’s a common problem that you record a track in the free open-source Audacity program, and then you remember or realize something you should have said. Sometimes you can insert audio like that to the end of the track – and you’d do that using the “append record” tool. Or, you can also insert audio like that into the middle of a track. It’s a bit more complicated to do, but can be done. In this video tutorial for Audacity, I’m going to show you how to do both, using the Append Record function, the split function, the time shift tool, and the cut, copy, and paste functions in Audacity. I’d love to make more of these tutorials that hit exactly on the needs you have! So please, let me know what you need help with and I’ll be happy to work out a tutorial on that sort of thing using Audacity! Send me your feedback and suggestions for additional tutorials and I’ll get right on them! One of the things that Audacity CAN’T do is mix tracks together “on the fly” like a regular mixer would do. That’s just one of the limitations. Maybe future releases will enable multiple sound sources coming in to the computer so that you mix in Audacity as you go. However, there IS something you can do that enables you to hear a track you already have placed in your Audacity project, so that you can talk over it appropriately. This fun little function is called “overdub.” I say it’s a way you can use Audacity like a mixer (sort of). This tutorial will teach you how to use the “overdub” function in Audacity to use the program like a mixer – at least as much as is possible. The free open source Audacity audio editing program is really not that hard… and these free video tutorials for Audacity will help you learn how to use it even quicker. How to use the Dyson Compressor effect to balance out audio volume levels. How to mix and render the tracks together. Let me know what you’d like to know how to do and I’ll get it put together! How to combine 4 tracks into one sensible intro track. How to adjust volume levels to mix your tracks together. There’s a ton more things you can do in Audacity. Let me know what you’d like to know how to do and I’ll get it put together! These Tutorials for Audacity are like a video manual for Audacity, one step at a time via video. Let me know what functions of Audacity YOU’D like to see me cover in future tutorials for Audacity!